What will you be doing to make Thanksgiving extra special at the Renoir House Apartments on the Upper East Side this year? If you’ve got the chops, you’ll likely be cooking a fantastic meal to satisfy some hungry guests, and if you’re really adventurous, you’ll want to try out a few things that go outside the usual fare of pumpkin, pecan, and apple pies. Fear not, there are plenty of Thanksgiving dessert recipes for you to test your baking skills with that have nothing to do with bog-standard pie, and we’ve collected a few of our favorites into one list for you to explore. Let’s trade that pie tin in for a cupcake one first, shall we? If you want to get inventive this Thanksgiving and give out individual-sized morsels everyone can chow down on, you’ll want to give Pumpkin Ginger Cupcakes a try. You can find a pretty good recipe for these over on Allrecipes, by way of baker Lisa Lewis. Light, fluffy, and embodying the taste of Autumn with their mix of crystallized ginger and pumpkin flavoring, you can get these whipped up in a mere hour-and-a-half, if you’re skilled. Alternatively, though, you might try a slightly different recipe from Baked by an Introvert. This unique take incorporates a bit of drizzled caramel sauce and cheese-based frosting that’s sure to delight. 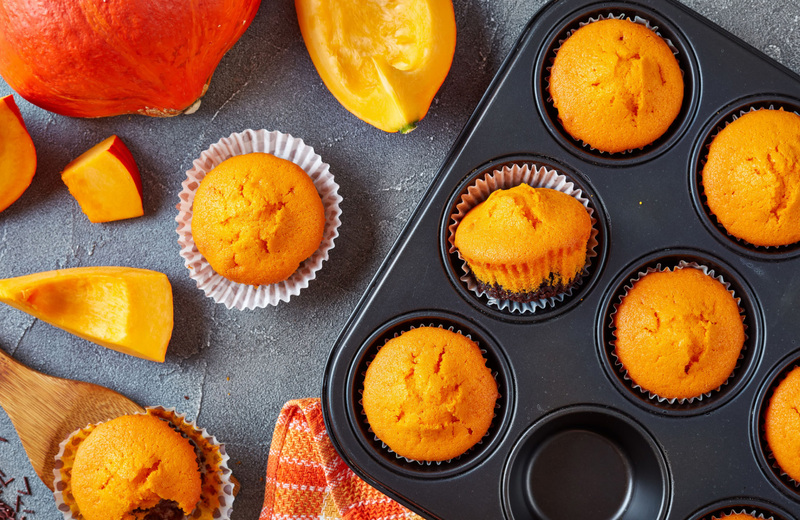 Best of all, this recipe is designed for “mini” cupcakes, so you can make plenty of small portions that are perfect as a quick snack during all the Thanksgiving festivities. Panna Cottas with cookies? How could anyone resist such a delightful combination? Few, if any, can say no to such a pairing, which comes courtesy of Shawn McClain over at Food & Wine. Cinnamon and flavoring, apple cider gelee — there’s a lot of flavor going into this recipe, and while it takes a while to complete (about four hours), you’ll find the results to be well worth it if you can pull it off correctly. Homemade ice cream is a perennial favorite in many a household, and if you’re up for the challenge, you can make this Thanksgiving special with a taste of Apple Cider Ice Cream from Saving Room for Dessert. In a word, it’s delicious, and has the perfect blend of flavors for fall — warm cinnamon, delicious baked apples — it’s all that a Thanksgiving guest could ask for. After thirty minutes of prep, you’ll be cooking for only ten minutes, meaning you can have this dessert whipped up in under an hour. Continuing with the apple cider theme, you might find that Apple Cider Doughnut Cake will add another dimension of non-pie goodness to your Thanksgiving dessert tray. This apple bundt cake recipe “tastes just like Fall’s iconic apple cider doughnuts,” so it’s got a well-deserved spot among the Thanksgiving treats, and is simultaneously simple, easy to make, and big on flavor and enthralling aroma. This recipe will take about an hour to complete, and can serve about twelve people. This recipe, which comes from Brown Eyed Baker, is more like a tasty treat than full-fledged dessert, but it’s tasty enough to make our list all the same. If you’re not well-versed in the art of making candies already, this one might take a few tries for you to get it right. Once you succeed, however, you’ll be treated to a wealth of goodness. Thanks to the boiled apple cider mixed in with the cinnamon and sugar, these bite-sized morsels will have the taste of grandma’s apple pie. Once you’ve got it down to a science, you’ll be able to whip up about 64 of these tasty caramels in a single hour. Who loves spice? If it’s Thanksgiving, we all do, and you can give your guests a taste of what they’ve been craving with these Spice Cookies (and Pumpkin Dip) from Taste of Home. Chock full of cinnamon-goodness and complemented with just the right amount of sugar, these cookies will taste heavenly on their own, and when you add that creamy pumpkin dip, you and your guests will be taking a one way trip straight to “flavor town,” provided your baking skills are up to snuff. This isn’t a particularly difficult (or lengthy recipe to follow, though, so you should be alright! The name alone tells you almost everything you need to know about this delightful cake. Toffee and Coffee brought together in one package — what more do you really need? With the addition of those chopped pecans, it gets the taste of Fall right, and you can experiment with adding extra ingredients (or even making a few substitutions) once you’ve got the original mixture under your belt. You can make 12-16 servings in under an hour too, so if you need something quick and easy, this is a good bet. Let’s say you still want an approximation of flaky pie crust, but aren’t interested in baking any pies. These Walnut-Filled Pillows are the way to go, as the golden brown exterior brings you the best of the pie experience without the cumbersome pie tin. Your guests will rave over the delicious filling and likely beg for a second helping. Thankfully, the 40-minute recipe yields 28 of these flaky pillows — more than enough to go around. Sure, the spacious residences and five-star amenities you’ll find at Renoir House add to its elegance and luxury appeal, but there’s one thing that make it truly special — the community. Without the stellar residents who call this place home, Renoir House wouldn’t quite have the same luster, so if you’ve always envisioned living in a place where the people are just as important as the apartments themselves, you’ll find no better place in New York to be. Make sure you check out everything else Renoir House can offer you, then make this your first choice for Manhattan living done right.